If the UK is willing to pay to stay in the Single Market, why leave the EU at all? 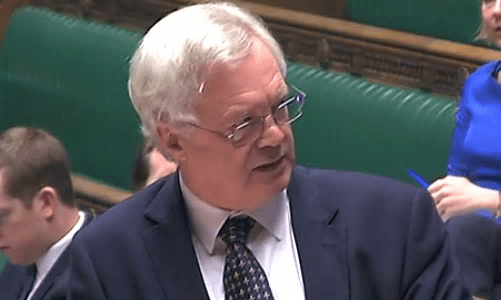 David Davis was asked if he would ‘consider making any contribution in any shape or form for access to the single market’ [Image: Parliament TV/BBC Parliament]. The answer should be obvious to everybody: Leaving the EU means the UK will no longer be subject to all those pesky protections for the human rights of its citizens, or the rights of working people. That is the real aim of Brexit – stripping you of your hard-won rights. And paying to stay in the Single Market will benefit international businesses – but you will pay for it. Where is the assurance that businesses who profit from the single market will contribute to the cost? And none is likely to be offered. This proposal is nothing more than the next step in the great ‘Leave’ con. How many of you are going to write to your MP and say that you won’t pay for big businesses to profit? David Davis has suggested that the government would consider making contributions to the EU budget in exchange for access to the single market, saying his Department for Exiting the EU would consider all options to get the best deal with the bloc. During questions in the House of Commons, the Labour MP Wayne David asked if the Brexit secretary would “consider making any contribution in any shape or form for access to the single market”. Davis said the government would look at the options during the article 50 process over the next two years. it is known that the main reason that they wanted to leave eu was the eu courts of human rights,who made it hard for ids and his pathetic bunch to pursue there campaign of targeting vunerable adults (sorry wca assessments), however whatever they talk about they still have to deliver and regardless of whatever rules they come up with,i vote with my money, let me explain that in language they understand, i don’t buy in sports direct, amazon and any other company involved in zero hours contracts, I am loath to buy a product that receives huge funding from the government without seeing a return especially when there a big multi-national using blackmail to make a threat. I also am a voter,something that they seem to forget, something that when they come round with there big begging bowl with vote blue written on it and there little handout of lies, i am going to remind them of one pure fact, I dislike liars so give me a reason that can prove to me that you are not a liar, safe bet there, they won’t be able to answer the question? Wecome back to the 1989 tory working rights act! Do anyone here remember no holiday/sick leave and no working rights for two years from starting a new job? Tory policy we can now look forward to!! !